Auckland was definitely feeling vibrant last weekend, with two events side by side downtown: the Open Streets initiative organised by Auckland Transport saw part of Quay Street closed to traffic (well, one side of the road anyway), and Japan Day brought the crowds to the Queens Wharf area, between The Cloud and Shed 10. Neither event would have been as good on its own, and while both could be improved (closing off more of the road and having more food stalls would help), we still enjoyed the atmosphere. I didn't take too many photos of the Open Streets activities (this is a food blog after all), but it was great to see the little kids on their bikes on the road. There was plenty of entertainment too, from clowns to accordion players, to games and rollerskating, to stunt riders on BMX bikes, to a samba band performance. A fireman's bike was displayed at one exhibit. We were mainly checking out the food for Japan Day, but inadvertently came across aikido, kendo and some dance and music performances as well. Some attendees definitely made more of an effort, with kimonos and cosplay in evidence. A busy stall near the ferry building. There were far more people than the stalls could handle, with queues of an hour. 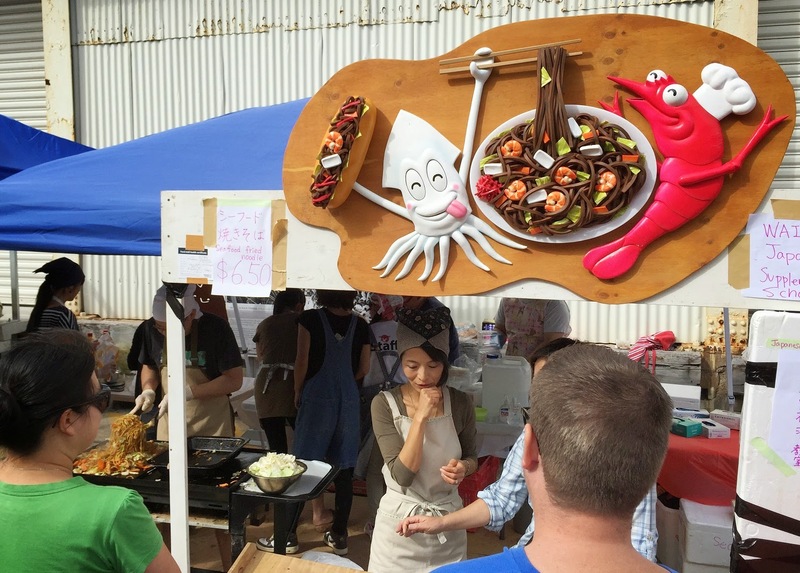 Some things were sold out by the early afternoon, and even the Taiwanese, Chinese, Vietnamese and non-Asian stalls were full of hungry people. Although we only dashed around quickly (as much as the crowds would allow), we still saw some things that looked interesting. For instance, there was a demonstration of how to make mochi. You could buy freshly cooked cakey things like dorayaki and baby castella. For those after more savoury street foods, you could buy dango (marinated rice balls on a stick), yakitori skewers, and marinated cucumbers. We filled ourselves up on teppanyaki fried noodles, but there were plenty of other Japanese foods to eat, including takoyaki, okonomiyaki and udon. Fried noodles from one of a number of stalls. There were some beautiful pastries for sale, as well as green tea ice cream, black sesame pudding, banana rolls, and (as I discovered later) crepe cones. Next time, we would make sure to arrive early, so the queues are hopefully shorter! 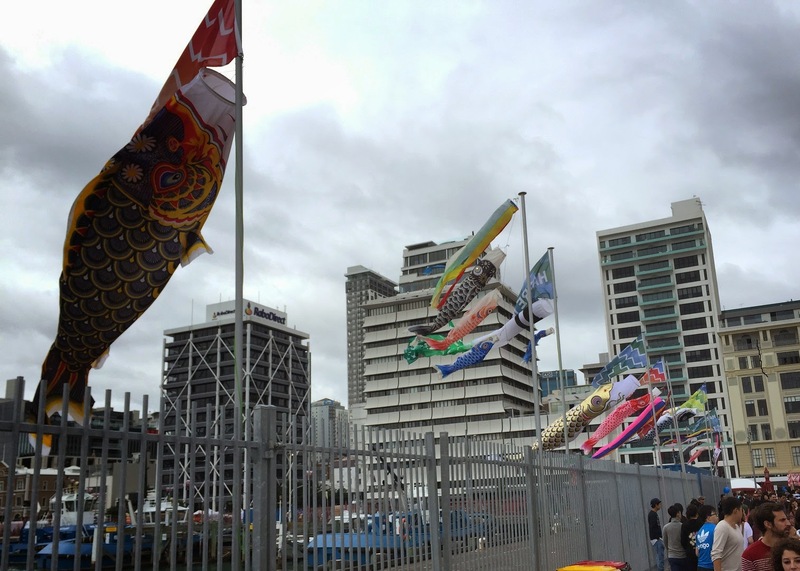 It's so great seeing so many things happening in Auckland nowadays. 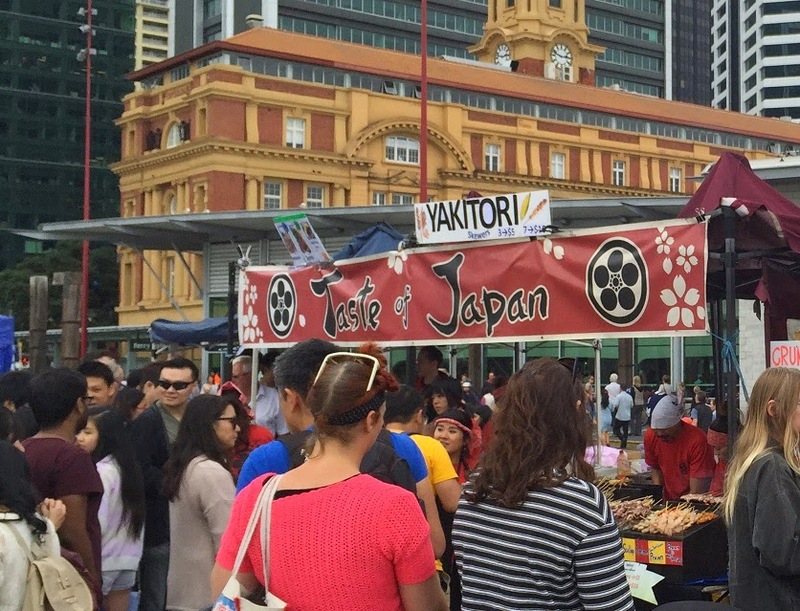 I completely missed Japan Day though -was there much advertising for it?? I guess there wasn't much advertising. I think I came across it in Twitter, and some Japanese friends on Facebook shared it too. There was a lot of queuing though, so I was kind of glad it wasn't more widely known.